By Charles Monagan. 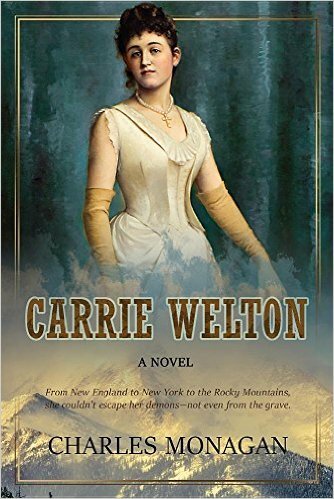 Eighteen-year-old Carrie Welton is restless, unhappy, and ill-suited to the conventions of nineteenth-century New England. Using her charm and a cunning scheme, she escapes the shadow of a cruel father and wanders into a thrilling series of high-wire adventures. Her travels take her all over the country, putting her in the path of Bohemian painters, poets, singers, social crusaders, opium eaters, violent gang members, and a group of female mountain climbers. But Carrie’s demons return to haunt herm bringing her to the edge of sanity and leading to a fateful expedition onto Long Peak in Colorado. That’s not the end, though. Carrie, being Carrie, sends an astonishing letter back from the grave and thus engineers her final escape – forever into your heart. Published by: Penmore Press. 2016.